What is the file association? Under Windows it is usual in most cases that you do not have to know which type of file you are initializing - you just click on it and it opens by itself in the program in which it is possible to be used. In case it is a program it is initialized, a document is opened in particular program. This all is possible thanks the file association. More friendly expression is allocation of a file to particular program. By associating the file gets the icon of the program to which it is allocated. 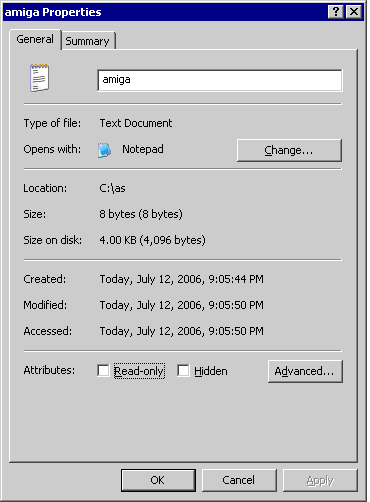 The user has the possibility to see immediately to which program the file belongs. Questions and answers to association. Why I cannot see all the programs in the Explorer although those are displayed in another file manager? 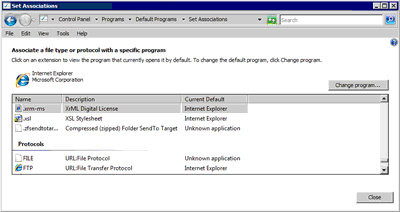 - The Explorer does not shows system files or files that are marked as hidden. In case you want to see these files you have to adjust the settings for file displaying. The settings you can edit through Explorer menu - choose Tools and Folder options. In the displayed menu select Display hidden files and folders. In Windows 2000/XP/Vista you can hide the protected system files using selection Hide protected operating system files. How to display file extensions? - Initial settings is not to display the endings, so you have to go to settings of file displaying and cancel the selection Hide extensions for known file types. Is it possible to change or specify association settings? - Yes, and it is often even necessary. 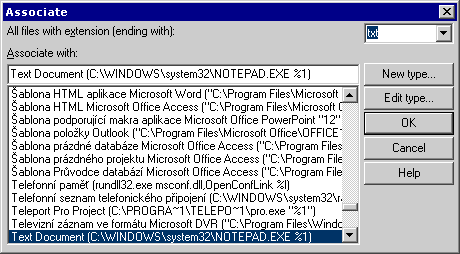 Some programs enable to view several types of files. It can happen that you have in your computer several programs from which a particular one you do not want to use is associated with your favorites documents. You can change this in settings. From folder facilities choose File type. 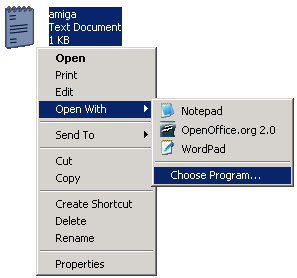 Here you can change the association, the icon or to find out which type of file is associated to a particular program. Windows Explorer: Right-click the file – Select "Open with" > Choose a program from the list of programs or use the "Choose Program.."
Total Commander: - choose the file - menu Files - Associate With..
Why the request for program specification appears when I click on a file? - This type of file is not associated to any program. 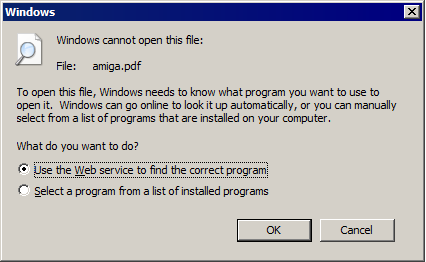 In this case you have to specify the program in which you want to view the file. The most certain selection is text editor or to search out some details about the chosen file types. This can be used for another type of association. Delete the existing association in "File types" and run the chosen file in the Explorer. 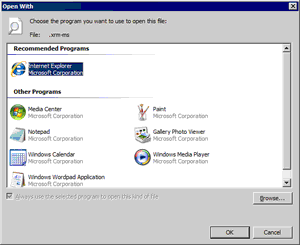 The next step is to choose a program to open the file with using "Always use the selected program to open this kind of file". How to restore automatic starting of batch *.bat files?